Nobel Prize winner Erwin Schrödinger established the wave mechanics formulation of quantum mechanics, which portrayed electrons as waves, spread out rather than in any given location. Schrödinger showed that his wave mechanics and Werner Heisenberg’s matrix mechanics, although superficially different, were mathematically equivalent. In his later years, Schrödinger became unhappy with quantum mechanics and is famous for the Schrödinger’s cat thought experiment, in which he attempted to show the absurdity of the Copenhagen interpretation of quantum mechanics. Schrödinger’s 1944 book What is Life?, although not entirely original, had a profound effect on the future of genetics and molecular biology. Schrödinger wrote that the gene was an aperiodic crystal – a code script for life. His book inspired a number of scientists – including three of the main players in the discovery of DNA’s structure – Francis Crick, James Watson and Maurice Wilkins – to pursue research in that field. Erwin Rudolf Josef Alexander Schrödinger was born in Austria’s capital city, Vienna, on August 12, 1887. His father was Rudolf Schrödinger, a botanist. His mother was Georgine Bauer, the daughter of a chemistry professor. Erwin was their only child. He was a gifted student in the local Gymnasium. His strengths and interests lay not only in the physics and math courses that he mastered with effortless enjoyment, but in languages, both ancient and modern, as well as poetry. Schrödinger attended the University of Vienna in 1906, obtaining his doctorate in 1910 with the thesis “On the conduction of electricity on the surface of insulators in moist air”. He then became an assistant to Franz Exner at the university, conducting practical work for students. During the First World War Schrödinger served as an artillery officer. In 1920 Schrödinger became an assistant to Max Wien, in Jena, before accepting an associate professorship in Stuttgart. The following year he moved to Breslau, as a full professor, however this position was also short lived. That same year in 1921, he moved again to the University of Zurich where he remained for the next six years. From 1921 he studied atomic structure and then in 1924 he began to research quantum statistics. It was here that he made his important contributions to physics with his wave equations. In 1927 Schrödinger accepted the prestigious position as chair of theoretical physics, succeeding Max Planck, at the Friedrich Wilhelm University in Berlin and remained there until 1934. By that time, Schrodinger found that he could not accept the atmosphere of anti-Semitism that increasingly dominated German life. He moved to the UK, becoming a Fellow of Magdalen College at the University of Oxford. Schrödinger took a position at the University of Graz in Austria in 1936 but he and his wife fled to Italy in 1938 shortly after Austria was annexed by Germany. In 1938 he moved to Ireland, helping establish the Institute for Advanced Studies in Dublin. He became Director of the School for Theoretical Physics in Dublin in 1940 and remained there for 17 years, retiring in 1955. Schrödinger returned to Vienna in 1956 as professor emeritus at the university. In the early 1920’s, the primary evidence for the nature and action of subatomic particles came from indirect observations, for example, from noting the spectral lines formed when light passed through prisms. Schrödinger began experimental work in color and light, collaborating with prominent scholars. For his experimental work on radioactivity of the atmosphere Schrödinger was awarded the 1920 Haitinger Prize of the Austrian Academy of Sciences. Schrödinger also made important contributions to the kinetic theory of solids, studying the dynamics of crystal lattices. It was while suffering from tuberculosis and attempting a recuperative stay at a sanatorium in the 1920s, that he began writing his most important work. In this and five other papers published in 1926, he explained how different energy states of an atom’s electrons could be described and be predicted via wave equations. 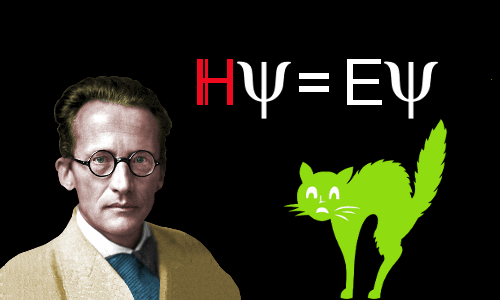 The Schrödinger Equation is his great contribution to quantum mechanics. Schrödinger received the 1933 Nobel Prize for physics together with Paul Dirac for the formulation of the Schrödinger equation. In 1935 Schrödinger published a three-part essay on “The present situation in quantum mechanics”. As an illustration, it contained a thought experiment (hypothetical only) as follows: A cat is in a box with a source of poison gas that would be triggered (or not) by the decay of one electron in one direction or another. Because of the uncertainty of the electron’s behavior, there exists a moment in time when the observer is unsure whether the cat is alive or dead, and in some sense, it’s both! When working in Dublin, he studied electromagnetic theory and relativity and published the beginnings of a unified field theory in 1943. His book “What is life?” published in 1944 relates quantum physics to genetics had a profound effect on the future of genetics and molecular biology. His last publication “Meine Weltansicht” (My World View) was published in 1962. Schrödinger led an unconventional personal life, marrying Annemarie Bertel in 1920 and also concurrently living with his mistress, Mrs. Hilde March. He had three children. He died of tuberculosis, aged 73 on 4th January 1961. He received the Max Planck Medal in 1937.